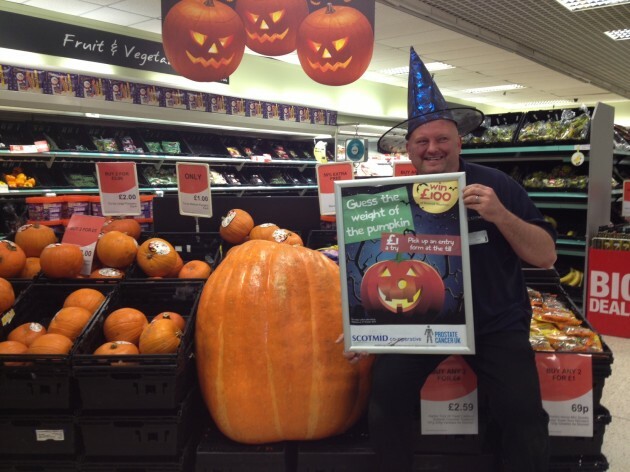 Team member Phil Henderson with the pumpkin at Scotmid Portobello. "Have a punt at the poundage of the pumpkins, with a chance to win a great prize and raise money to fight the most common cancer in men." Two giant pumpkins have taken up residence in Scotmid’s Portobello and Uddingston stores, as part of a Halloween ‘guess the weight’ competition. The competition will raise funds for Prostate Cancer UK and gives customers the chance to win a £100 shopping voucher. Each guess costs £1 and 100% of the proceeds will be donated to the charity. The entry that is closest to the weight of the pumpkin will win the gift voucher and will be announced on 31 October. The pumpkin was grown by DW Bond in Lancashire for Raith Fruit, and it took six months to grow from seed. Raith Fruit is one of Scotmid’s local suppliers. The average weight of a pumpkin is 10-20 pounds, while the current world record for the weight of a pumpkin is over 2,000 pounds. Prostate Cancer UK is Scotmid’s official charity partner for 2013/2014. Scotmid’s charity partnership scheme, which began in 2001, has raised more than £1 million for charities since its initiation, including The Princes Trust, RNLI and Marie Curie Cancer Care.